Hello! Today I’m sharing a masculine valentine using ‘S’more Love’ by Reverse Confetti. I was inspired by Reverse Confetti’s monthly sketch challenge for this layout. I knew I wanted this penguin to be the focal point, so I stamped him on Neenah card stock and colored him in with Prismacolor colored pencils. For the background I used a mix of papers from Avery Elle, Amy Tangerine and Jen Hadfield and die cuts from Reverse Confetti: ‘Stamped Note’ and ‘Leafy’. To finish off the card I applied Nuvo Crystal Drops in ‘Morning Dew’. That’s it! Thank you for reading! I love the fun mix of elements here that I would have never thought to put together. They wall work beautifully and I’m smitten! 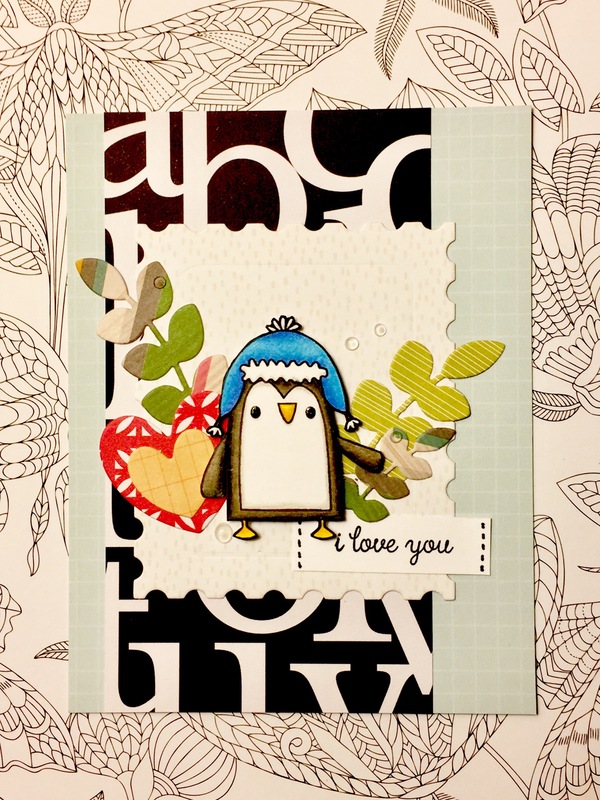 The foliage cut from pattern paper, your cute penguin, and the fun alphabet background is total winner ! Hi, Jennifer! What a super cute card. I found your card/blog through the challenge over at Reverse Confetti, and I’m wishing you the best of luck. I’d love to have you stop by and link up with us any time you can over at Word Art Wednesday. We have fabulous sponsors, and it would be a pleasure to have you link your sweet cards to our challenge. Have a blessed week, I hope you will stop by. This is so fun, I adore how you’ve colored that cute guy!